It is said that some experiences are a ‘must’ in life and everybody should try them at least once. One of them is hunting. If you are planning a hunting expedition with friends or going solo, then it is very necessary that you begin planning the essentials for the trip well in advance. As well as make sure that you don’t break the law. Make sure to familiarize yourself with the appropriate regulations. You can have a look at these regulations for reference or direct guidance if you live in Ohio. 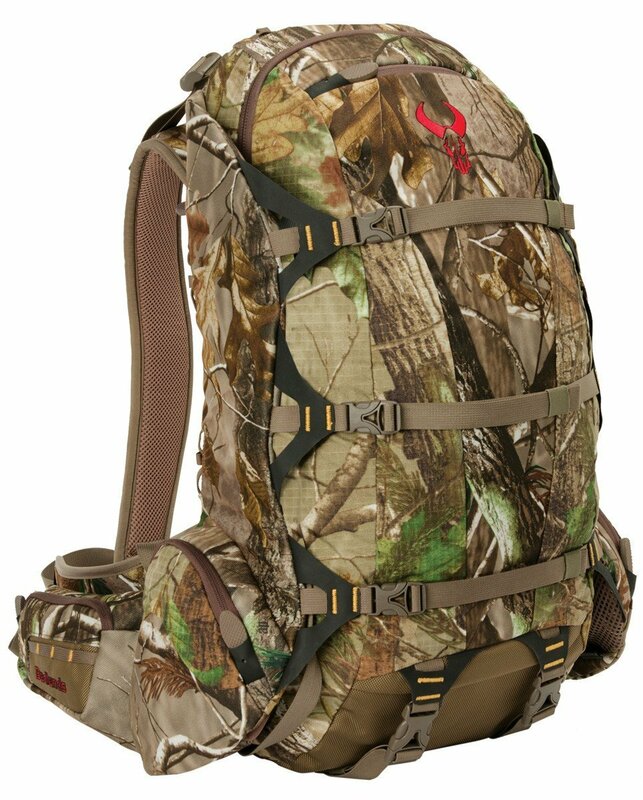 Those who are regular to hunting will vouch for how essential a hunting backpack is. One of the most basic and yet most crucial requirement, backpacks are very different from regular backpacks. They are customized for hunting and make it very convenient to carry everything you will require during your trip. 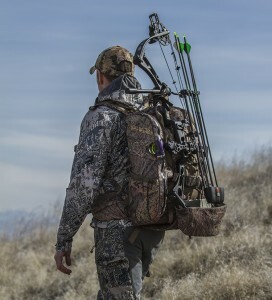 Hunting backpacks are built to stand rugged and wild conditions and are very strong. Be it brushing against the ground or getting caught up in bushes, these bags can handle it all. This makes you focus on the task at hand than worry about keeping your bag safe. Similarly, backpacks have a very good storage capacity. They are sometimes bigger than normal backpacks to accommodate more belongings. This feature of the bags comes in handy in situations where you might have to spend longer in the woods without easy access to food and water. Good backpacks stand out due to the fabric they are made of. Waterproof fabric keeps your gears and belongings safe in the mist and dew. In case of occasional drizzle as well a waterproof bag is a boon. The other aspect of the fabric is its softness or the sound it creates when rubbed. Good backpacks are made of materials that are not very noisy. This allows quiet movement to aid hunting. Along with having a good storage capacity, your backpack should also be easy to use. In case you are carrying a weapon, your backpack should not only have space for storing it but should also be such that you can easily access your weapon. Same is the case for water bottles or pouches. Hence, backpacks are also made such that they are easy to use. Since your backpack is going to stay on your back for long hours, these backpacks are generally light-weight. However, if you are opting for bigger bags and are planning to carry more items along, it is essential to check the ergonomic weight distribution the bag offers. Some hunting backpacks have frames that transfer the weight onto your hips. Backpacks without frames generally put weight on the shoulders. It is possible that you are not really a hunter but a fisherman instead. Well, you’ve done well to have a look at this page. After all, a hunting backpack would work for you too. However, a fishing backpack would do an even better job. So make sure to check out the review on fishing backpacks. Rugged brown colored hunting backpack by Eberlestock, this backpack is made from 1000 denier nylon which makes it a very strong fabric. Made to carry heavy weights, this backpack is fairly simple and convenient to use. It has plastic frame sheet that makes it moisture resistant along with internal aluminum cellular stays. Along with the padding, these support your back and make carrying heavy weights extremely easy. This backpack also has a rain cover that is stored in the lower pocket and can be pulled up when required. There are also compartments for two 3-litre hydration kits on the sides. The interiors have two levels of pockets making it convenient to segregate your belongings. The high quality of this backpack justifies its slightly higher costs. Click here to visit Amazon and get this backpack! 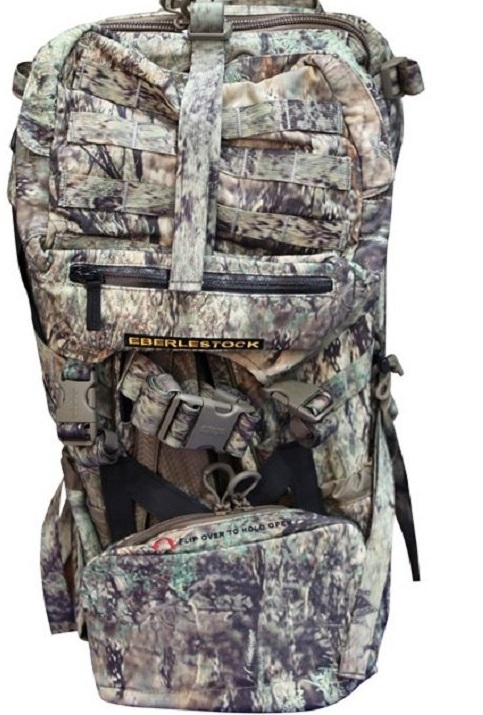 A perfect companion for shooting hunts, this backpack comes with a frame and a rifle-holder. It loads from the top and has a total of 10 zippers to make easy compartments for different gears. The backpack once emptied, can be detached and the frame can be used as a freighter frame. And if you are good with your shot, you can also carry your kill along since the backpack has a lashing system in place for this purpose. To make carrying easy, the waist belt and the shoulder straps are padded. A multi-purpose hassle-free gear, this bag is great value for money. A simple, regular sized backpack, this backpack is a very sturdy unit from Badlands. One of Badlands’ bestsellers, this backpack has a built in meat shelf towards the bottom that lets you carry your kill conveniently. Its compressible wing design helps to reduce its size for convenient carrying. But the bag can be opened up for more storage. This bag has an internal aluminum frame that helps transfer the weight to the hips. The shoulder, lumbar and hip straps and molded in a way that they provide maximum support while carrying the backpack. A great purchase, this bag looks trendy too! 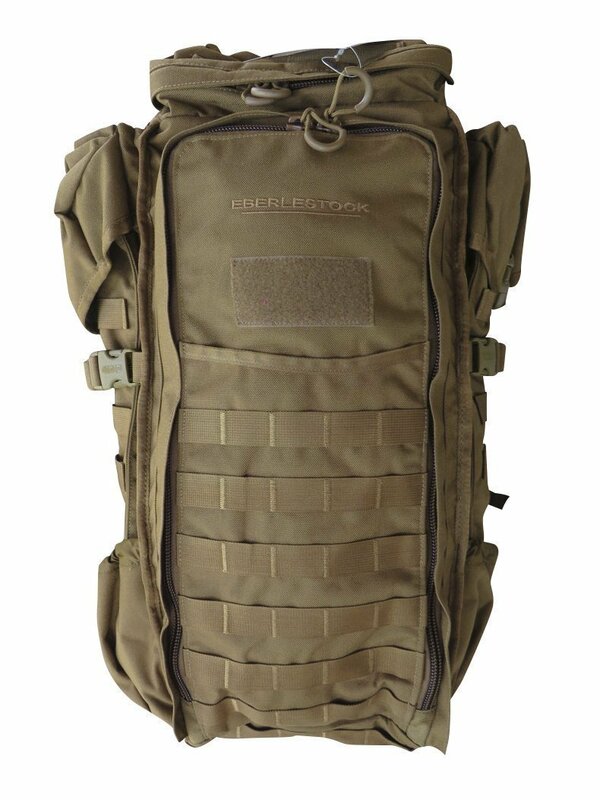 Another backpack from Eberlestock, this bag is made of 420 denier nylon. 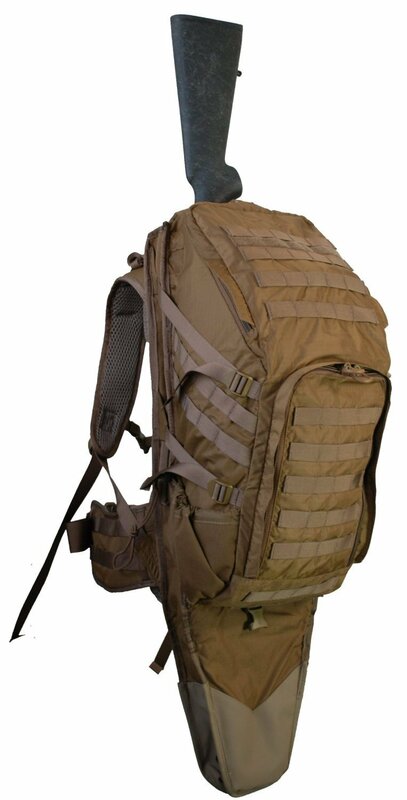 Weighing about 5.5lbs, this backpack has a scabbard that can be used as storage space for rifle or any other weapon. The bag is shaped in such a way that it hugs the body well and is easy to carry. This bag has multiple internal and external panels that can be used to attach additional accessories. This means you can carry a lot more with this bag. Every part of this bag is useful making it completely a no-nonsense product. This backpack from Eberlestock has contours that follow the body that make it very comfortable to carry. The bottom of this bag has a shelf design that keeps it stable on your back. The fabric of this bag does not make much noise when rubbed and hence makes it an ideal partner for a quiet hunt. This bag has both front and top load access making it very easy to reach out to things you need. With a 50 liter capacity, this bag lets you carry everything you need, in comfort. Depending on your need, the backpacks reviewed here can be chosen as you main hunting gear. Since hunting backpacks are available in a wide range of price, it is a good idea to research well and invest in a backpack that is convenient to carry and is durable, making each of your hunting trip a memorable one.